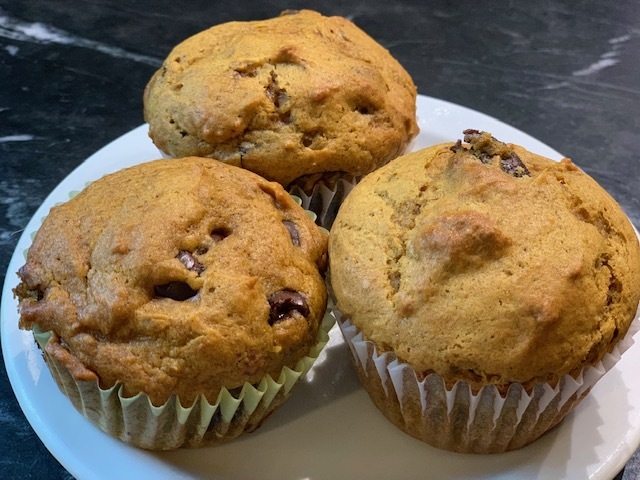 There is just about nothing better than starting a crisp fall morning, or even a dreary rainy one like we’re having today, with some amazing Best Ever Pumpkin Dark Chocolate Muffins. I figured it wasn’t nice to keep this joy all to myself, so here’s the recipe for you to try these amazing muffins your own self. Note this recipe yields 12 muffins, and I pretty much always double it because, well, deliciousness. Also note that you can use either all-purpose flour or almond flour to keep them gluten free, and either results in a great muffin. Preheat oven to 375 and line your muffin tin with paper liners. Measure the dry ingredients in a bowl and slightly mix. In a smaller bowl, mix the wet ingredients (eggs, pumpkin, coconut oil, vanilla). Add the wet ingredients to the dry and combine until just mixed. Here’s where I slow down for a minute. I prefer these muffins without chocolate—crazy, right? But I do. My kids, however, like pretty much everything with a dose of chocolate. So I separate the batter here and scoop some of the muffin batter before I add chips, then add chips to the rest. Depending on your love of chocolate, you’ll want to either use a half cup of chips or a full cup of chips. You can of course substitute milk chocolate chips for the dark chocolate if that’s your preference. I use an ice cream scooper to scoop the batter into the muffin tins and I fill ‘em up until the liners are almost full, because I want nice, pretty, BIG muffins. Bake for 20-24 minutes, testing for doneness with a toothpick at about 20 minutes. I usually bake these for 10 minutes on one oven shelf, then turn them around and move to another shelf for the remaining baking time. You know your oven, so do here what works for you. That’s it! Quick and easy, and the perfect breakfast treat—for a Sunday or any other day. If you try these Best Ever Pumpkin Dark Chocolate Muffins, let me know what you think, okay?